Latest Generation Crossplane Crankshaft Engine: The potent 998cc inline 4-cylinder engine features the same Crossplane Crankshaft technology developed in Yamaha's renowned YZF-R1® superbike. Tuned specifically for the MT-10™, this engine develops awesome low- and mid-rpm torque with arm-stretching top-end power. Ultra-Modern Engine Design: The MT-10 motor features the very latest in engine design to create the ultimate high-performance street sportbike. Engine reliability is ensured with strong, lightweight forged pistons and carburized fracture-split connecting rods moving through an extremely rigid, closed-deck cylinder block. The engine's cylinders are slightly offset to reduce friction losses, with plated bores for excellent heat dissipation and cylinder sealing. And rocker-arm valve actuation utilizes the lever ratio of each rocker arm to allow for larger valve lifts while using lower camshaft lobes and reduced spring pressure, further boosting power and efficiency. R1-Derived Crossplane Crankshaft Engine: The potent 998cc inline 4-cylinder engine features the same Crossplane Crankshaft technology developed in Yamaha's renowned YZF-R1 superbike. The crossplane design nearly eliminates inertial engine torque to provide a direct connection between the throttle and rear wheel, for maximum traction and linear torque feeling. 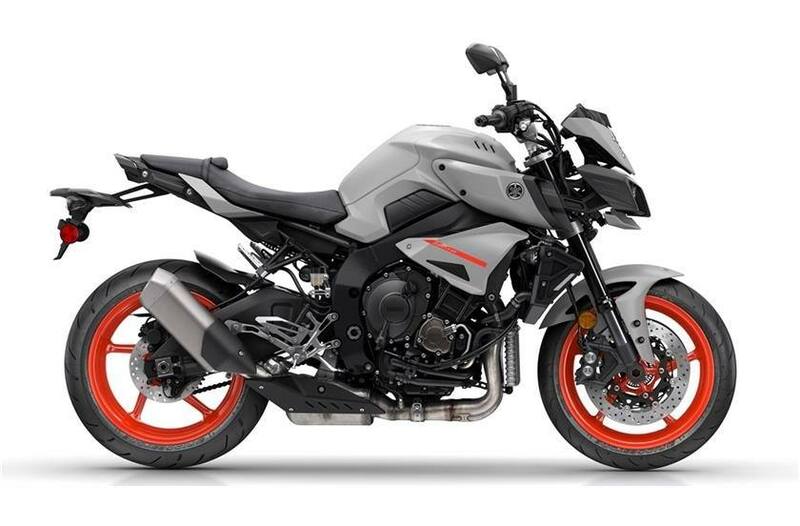 Tuned specifically for the needs of the high-performance street rider, the MT- 10 engine develops awesome low- and mid-rpm torque with arm-stretching top-end power. 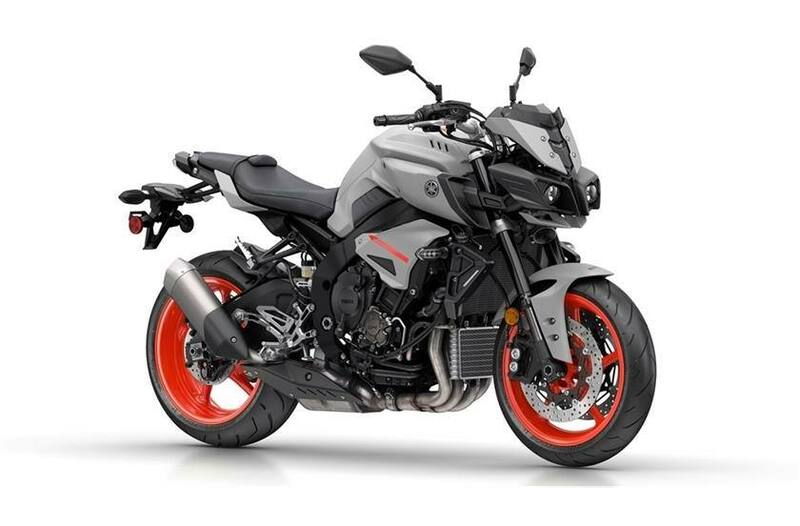 Lightweight Exhaust System: The MT-10‘s stainless steel and titanium exhaust system features a compact midship exhaust chamber for mass centralization and excellent handling. Exhaust flow is regulated by Yamaha's Exhaust Ultimate Power valve (EXUP®) system to provide optimal exhaust back-pressure across the entire rpm range, further improving efficiency. Advanced Clutch: Yamaha's assist and slipper clutch is used to give the rider smoother, more confident downshifts when entering corners aggressively, as well as a lighter pull effort at the lever, all while easily handling the torque of the MT-10's high-output, inline-four motor. 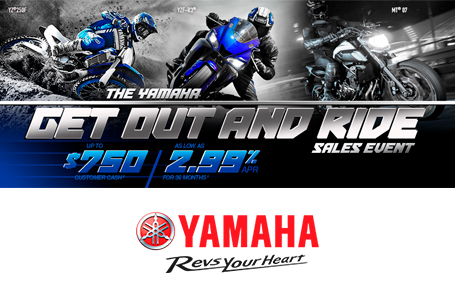 Yamaha Chip Controlled Throttle: The ride-by-wire Yamaha Chip Controlled Throttle (YCC-T®) system senses the slightest throttle input by the rider and instantaneously calculates the ideal throttle valve opening and fuel input. This technology contributes to the rider's feeling of torque and controllability from the potent 4-cylinder engine. All-LCD Instrument Panel: A highly-legible instrument display provides crystal clear information for the rider at a glance. The all-LCD design is lightweight and compact, with a large speedometer display and bar-type tachometer. The panel also includes a fuel gauge and fuel economy readouts, a gear position indicator, clock, odometers and warning indicators. An upshift timing light is also programmable to the rider's preferences. Linkage-Type KYB® Shock: The four-way-adjustable KYB® piggyback-style shock uses a rear bottom link pivot position that is optimally placed to provide optimal handling and excellent transmission of engine torque to the asphalt. Like the front fork, the MT-10's rear suspension offers a wide range of adjustment and a smooth, well-controlled 4.7 inches of wheel travel. Aggressive Styling: The MT-10 displays raw aggression from every angle, with a muscular central core that highlights the machine's power and unmistakably futuristic styling. With its belligerent design and unique elements—including the compact frame-mounted front mask and dynamically shouldered fuel tank—the MT-10 stands out as the king of the MT series.